Another Great 5 Pickle Burger…and close to home!!! The Assistant Pastor at my church and life long friend Gus Clouse, told me Sunday about a new killer burger place he had disovered, so today I took him and my Pastor Weyan McGuire up to Big Bob’s Burgers in London, Kentucky. Wow, this was one of the very best burgers I’ve ever had, so 5.2 Pickles my highest score! This burger clicked all the boxes and then some! The great folks at Big Bob’s ddi it up right (below) You have to heck this place out if you are anywhere near 176 Abbuhl Road in London! 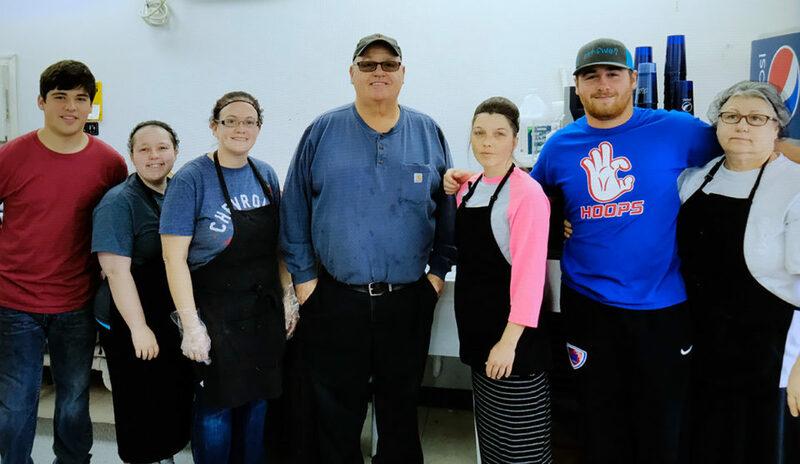 Left to Right; Tanner Burns, Kenya Hoskins, Stacy Alsip, Bobby Sizemore ( “Big Bob”the owner ), Crystal Knox, Matt Sizemore and Barbara Sizemore (owner). Until today if I wanted an incredible burger it would have meant going to Coalfax, Washington or Moab, Utah. Now I’m always less than 15 miles away from a great one!!! You broke the pickle barrier! That must be some burger. I see many delicious burgers in your future. Happy for you! It may be time for a road trip to Stearns with a side trip to London. You come up and punch us on me!